Views don’t come much better than this. Friends back home are wrapping up for the winter. But I’m relaxing on a sun-drenched balcony, taking in the splendor of a vast, blue lake stretching into the distance, framed by imposing green mountains. The sky overhead is perfectly bright, heralding yet another clear, warm day. Here you can spend it canoeing or kicking back with the many expat friends you’ve made around town. And the stunning lake-view retreat you call home can cost less than $200,000. 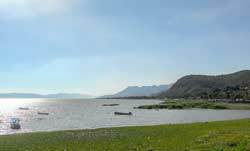 This is Lake Chapala…a snowbird’s paradise that is home to a large and welcoming expat community. And that’s not all. In my opinion, Lake Chapala has the best-value real estate you’ll find in any of this country’s expat hubs. Sitting at an altitude of 5,000 feet in west-central Mexico, Lake Chapala (the country’s largest freshwater lake) boasts one of the best climates in the world. Expect daily temperatures between 75 F and 78 F. Even when it does rain, it does so courteously: normally at night. Those lake views aren’t too shabby, either. With an amazing network of organized activities geared toward the large expat population, Lake Chapala offers an affordable lakeside lifestyle (figure $1,500 a month all in). No wonder as many as 15,000 or so expats choose to live here full or part-time. The combination of scenic lake views; warm weather; low-cost, convenient living; a flourishing expat community; and great-value real estate is something you won’t find anywhere else in Mexico. Lying along the lake’s north shore and only a few miles apart, the two small towns of Chapala and Ajijic (a-hee-heek), known collectively as “Lakeside” by the locals, are the area’s main retirement hubs. The Lakeside area has grown a lot in recent years and shows no signs of slowing. New construction continues as expats keep coming. Ongoing development is gradually closing the distance between the two towns, but Ajijic still has more expats and higher property values. This is because Ajijic has long been a getaway for wealthy city folks from nearby Guadalajara, who are looking for hillside vacation homes overlooking the lake; these are harder to find in Chapala. The larger expat presence in Ajijic has also increased property prices here. But real estate in both communities remains very affordable. In Chapala, expect to pay rent of $500 to $850 a month for a comfortable two-bedroom, two-bath house. Similar properties in Ajijic may cost an additional $100 or more per month. Prices in the most popular areas in Ajijic have held steady for the past five to eight years, despite the global economic downturn. Less popular (but still attractive) lakeside areas have seen prices fall by perhaps 10% to 20%, and the entire market is in the process of a steady recovery. Factoring in the strong U.S. dollar (the strongest in more than a decade) and weak peso makes this the right time to make a move. If you know where to look, you’ll find centrally located homes in this area for as little as $45,000. For that, you’ll get to live in a sunny and affordable haven as the snows pile up back home. Lake Chapala has the best-value real estate you’ll find in any of Mexico’s expat hubs. Buying here makes sense from an investment standpoint, too. The growing number of expats has provided a solid base of buyers and renters that won’t disappear any time soon. Snowbirds fleeing the cold North American winters flock to Lake Chapala, nearly doubling the normal population during those months. All these expats need a place to live or stay. So if you’re after an investment property, put Lake Chapala on your radar. Resident expats report that you’re almost guaranteed 100% occupancy. Year-round rentals are also in high demand—and not just from expats. 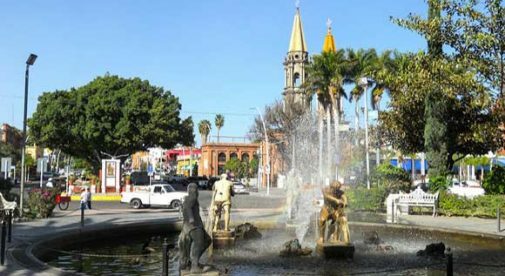 Rising home prices in Guadalajara, and the presence of large multinationals in the area, are leading many Mexicans to relocate here. So even if you’re just in the market for personal use, you’ll have buyers and renters aplenty if you move on. One of the great-value properties to be found here is located in the Villa Nova community just west of Ajijic town center. Here $95,000 buys you a two-bedroom, two-bath house with a backyard and garden area, modern kitchen with wooden cabinetry, modern bathrooms, and a carport with parking for two cars. This home could easily rent for $750 a month, giving you a gross yield of 9.5%. Rental properties close to the village centers are very popular with snowbirds, as most will not have cars and so have to get around on foot or use public transport. In Chapala, I found a basic home in need of only a little TLC going for just $45,000. This two-bedroom, one-and-a-half-bathroom home is right at the heart of town, an easy walk to everything you would need. It has a Mexican colonial kitchen, separate laundry room, and ceiling fans throughout, as well as a railed balcony on the second level. It’s the kind of place I would feel comfortable living in. This would make a great rental property or would also be perfect as a second home if you’re after a snowbird lifestyle. If you were to rent this for a year at $500 a month, you’d generate a handsome gross yield of 13.3%. Another great investment choice is the San Antonio neighborhood, situated about midway between Chapala and Ajijic. San Antonio straddles the highway, with the southern half near the lake and the other half climbing up the hillside. Choose the lakeside half if you’re after an investment property, as seasonal renters will want to be closer to the bus route. Residents of this area can reach all the shops and eateries they need with a 10-minute walk. Here, for $99,000, you could buy a modern two-bedroom, two-bath, second-floor condo with a relaxing view of the pool and garden. A light evening breeze ensures you won’t need A/C. This home would make any snowbird happy, and would be wonderful for a full-time residence, too. You could expect an annual gross yield of 9.1% if you were to rent it for $750 a month. The owners say they might even throw in their Nissan vehicle to sweeten the deal. If you’d rather rent in Ajijic, then a cozy option can be found in the Chula Vista neighborhood. This two-bedroom, two-bath rental has lovely landscaping with shaped shrubbery and a small yard. It has an open feel created by numerous large windows, which let in plenty of light. The house is furnished and comes with a beautiful brick fireplace and a separate laundry room, all for $850 a month. Properties with lake views are highly prized but still readily available. For just under $300,000, you could own a magnificent 3,000-square-foot, two-bedroom, two-bath house in a gated community in Ajijic, complete with a large open terrace and a wet bar. You’ll have stunning views over the blue expanse of Lake Chapala on one side and serene mountains on the other. If you have set your heart on a permanent relocation to this area, this home would be a perfect option. Another home with great lake views is located in the Chula Vista North community. This two-bedroom, two-bath home comes with a private garden and a deep Jacuzzi tub. All told, you’ll have 2,000 square feet of living space with beautiful bóveda ceilings in the open living area. It can be yours for $185,000; it’s been reduced from $192,000, as the owner wants a quick sale. If you’re after a lake-view property for under $200,000 to call home in retirement, look no further. So which of these towns, Chapala or Ajijic, is right for you? As the space between the towns ﬁlls in with businesses along the two-lane highway, the Lakeside area may become one community in the not-too-distant future. For now, though, you still have a choice. Spending a bit more for Ajijic properties will put you near many other expats and give you access to a full menu of organized activities, clubs, and volunteer opportunities. Ajijic boasts a beautiful golf course/club, as well as a popular tennis club where world-class professionals can often be found sharpening their games. Civic organizations such as Rotary have a large membership in Ajijic. There is also an active theater group, Spanish clubs, garden clubs, wine tastings, singles’ mixers, and organized bus trips exploring the region. With so much at hand, it’s no surprise that expats in Ajijic have put down deep roots. Chapala, on the other hand, has more of a traditional Mexican feel and does not yet have such an array of expat clubs and activities. Better real estate bargains can be found as a result. In any case, the short bus ride between the towns makes it easy to enjoy the best of both locations. With Mexico’s second-largest city, Guadalajara, and its international airport less than an hour away, residents of the Lakeside area lack for nothing. If it can’t be found in either Chapala or Ajijic, it can certainly be found in Guadalajara. With the airport so close, heading north of the border to see the family is easy. And, of course, they can always ﬂy south.